The word for today is ‘antimacassar‘ – a piece of cloth placed on the back of a chair to protect the seat fabric from dirt. A decade ago they were a common sight onboard V/Line trains. They were fitted to the seats onboard the Sprinter trains. As well as the newest VLocity trains. As you might expect, antimacassars on a V/Line train would get dirty quite quickly, as well as being a target for vandalism. Good thing they came in boxes of 2000! But by 2008 they disappeared from VLocity trains used on commuter services. And by April 2009 they had started to disappear from the locomotive hauled carriages used on long distance services. The word at the time was that the manufacturer went bust, and V/Line couldn’t find a new supplier. 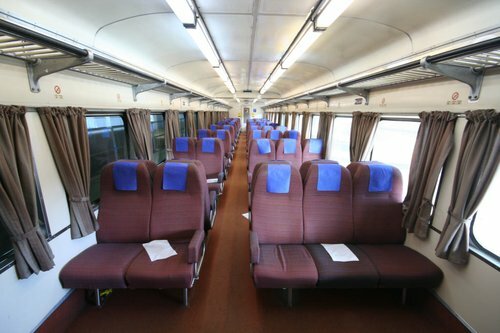 In the years since nothing has changed – V/Line seats are still bare, the layers of head grease increasing day by day. 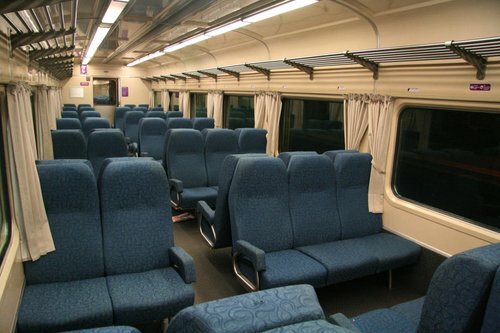 V/Line antimacassar supplier was Merino Pty Ltd in Queensland, which entered administration in 2007. A failed punt on recycled paper and a million-dollar-plus water compliance bill helped quicken the collapse of Australia’s oldest tissue manufacturer. More than 100 staff at Logan City-based Merino were made redundant earlier this month as the bulk of the business and its assets were sold to a Victorian rival for $29.4 million. Merino, whose brands include SAFE, Bouquets and Earthwise toilet paper, had lost more than $21 million since 2005 before entering voluntary administration last December. 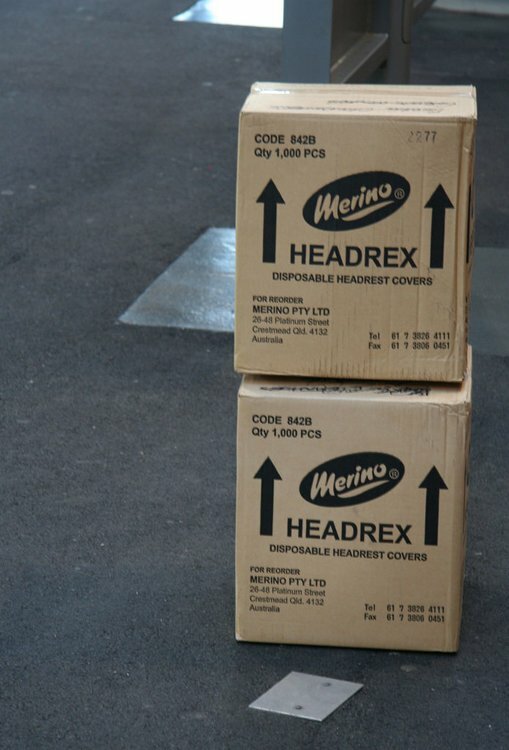 The ‘Headrex’ trademark was lodged back in 1973 under class 24 “covers of all kinds including antimacassar, formed of non-woven fabric or other material”, and last updated in 2008 by Encore Tissue Pty Ltd.
NSW Trainlink still uses them on their regional trains. Maybe VLine could use the same supplier. Good point – I’d forgotten about them. I suspect that V/Line dumped antimacassars to save money, and don’t care about dirty seats. This is bit of pettifogging cost-cutting that will cost more in the long term and result in carriages looking shabby. What is more disappointing though, is the pictures of “long-distance” train interiors with 3 + 2 seating and 2 + 2 in first class. Having traveled extensively in Britain on similarly long-distance services, it is immediately noticeable that standard class seating is 2 + 2 and first class is very luxurious with 2 + 1 seating. The 3 + 2 that we see quite a lot in Australia is only on shorter-distance commuter type trains in the UK. Admittedly the width of the carriages is slightly less over there, though nowhere near the width of an extra seat. Another point is that journeys are shorter in time even where they are longer in distance. For example, I recently traveled by rail from London Kings Cross to York, just over 300 km., in one hour 50 minutes. Victoria’s ‘Regional Fast Rail’ is not fast at all by world standards. The maximum speed on Victorian RFR routes is 160 km/h, which in a European context would be regarded as non-high-speed routes. It is also worth noting that I had a very good hot breakfast on my way to York, served at my seat. If that were offered on V/Line trains would there even be a table to eat it on? 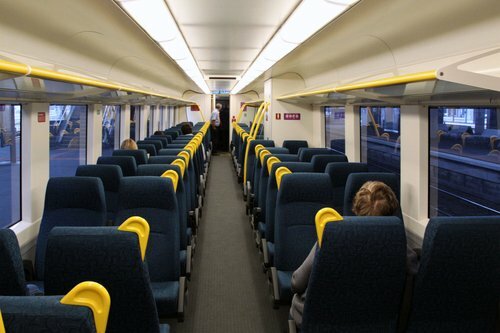 2 + 2 seating in standard class is the current standard in Victoria for the new build VLocity trains – they were originally planned to have narrower 2 + 3 seating. Well there you go. I always wondered what happened to Safe recycled tissues/toilet paper. Seems like they still exist. But ‘Naturale’ brand is the usual recycled toilet paper and paper towels that I see in the supermarket. I keep thinking of Anti-Macca’s! I was wondering only the other day what had happened to the V/Line antimacassars. The top of each seat back had a little slot into which a tab on the antimacassars fitted. Do the new-build VLocitys still have that provision? I’ll have to take a closer look and report back. Antimacassars were originally meant to protect seat fabric, or leather, not from dirt but from ‘Macassar’, a hair oil used by gentlemen in the 19th and early 20th centuries. Now, in the 21st century, hair oil is rarely used, but many people have naturally oily hair so antimacassars still have a use. Yes indeed, along with the diamond ring scratches put there deliberately by complete morons intent on criminal damage.